Using filters, you can group information to analyze different factors or even download your call history for record keeping. What information does the call history contain? What is the business value of this? Download .csv files to create your own reports. With all this data you can make the best plans of action. For example, after reviewing the list of missed calls, you can call back the clients or listen to their voice messages. Thus you will cut the negative effect of the missed calls. 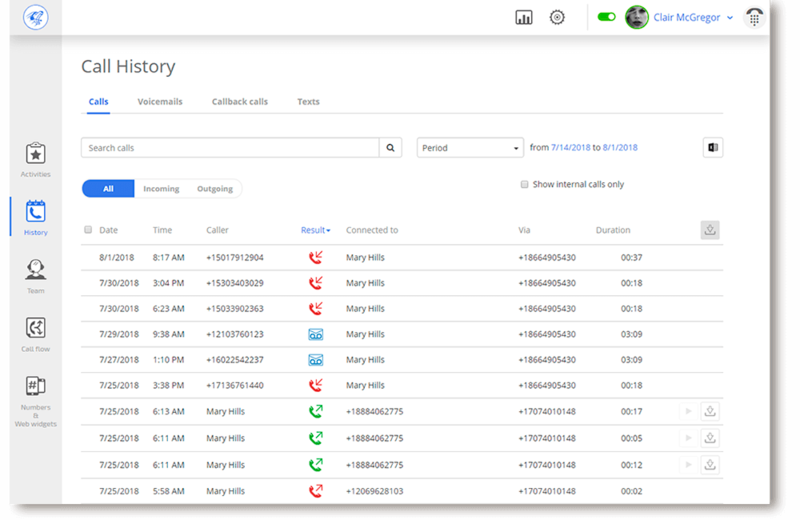 To reduce the number of missed calls, you can analyze the report about the reasons for missed calls (no one picked up the call, the call duration is less than 4 seconds, voicemail left). Which of your team members have missed calls and at what time? What is the ratio of received and missed calls, and the average time it takes to answer? To evaluate the efficiency of advertising campaigns, you can allocate a number for each campaign and filter the call history to see the performance of these numbers. How can you filter the data?